The Fun Way to Learn Guitar, Theory, and More!!! Learning the guitar can be hard work. Training your fingers takes years. Add on to this the need to learn the notes on the guitar and music theory and you have a monumental task. Enter Guitar Games. 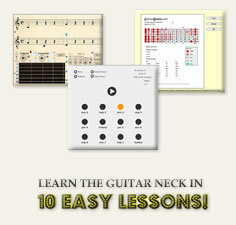 Guitar Games isolates the intellectual part of guitar playing making learning faster. Why Play Guitar Games? Because Flash Cards are Boring. Learning to read music and understand music theory will help any guitarist. But traditional methods of learning can be slow at best and at worst so boring that you quit. Guitar Games makes the necessary repetition fun. Make your practice fun, play today! "Learn the Guitar Neck in 10 Easy Lessons." Compared with Absolute Fretboard™, Ear Master Pro™, and Music Ace™. Try GuitarGames for free. We're sure you will find it is an incredible value, with a complete fretboard trainer, music theory, and ear training program. Its fun guitar-centered approach is unlike any trainer available. Start making your practice fun again!